Nureva Span software is a cloud-based ideation solution which can be displayed directly on to a wall, Avocor interactive display screen or on any mobile device. It is ideally suited to industries such as education, manufacturing, corporate, healthcare and publishing & design to name a few. The expansive visual collaboration solution provides accessibility to provide creative ideas interactively in real-time, and check progress of projects as they develop. Teams can create, share and edit digital content effortlessly. The Nureva Span is an expansive, brainstorming solution which can be used by all members of a team to collectively use and share ideas and solutions, either on-site or remotely. It is now becoming the norm for most companies to look for ways to ensure employees can still communicate and converse without physically being together. By turning on QuickShare it allows someone to create a new virtual canvas either in the office, on their laptop, tablet or mobile phone and invite colleagues to the project to gather their feedback through dot voting, sticky note comments and more. Swap your sticky-note wall, flip charts and paper sketches for the digital solution designed to provide speed and flexibility to your work. With Span software you can annotate with ease, and as everything happens in the cloud in real-time, you don’t need to save your content. You can close the canvas and go back to it when it suits and pick up where it was left. Collaborative teams need space to work, to step back and see the big picture. With the Nureva Span software, you can create up to 30’ (9.14m) of collaboration space on virtually any wall space for expansive, visual collaboration. Alternatively, as certified partners with Avocor, Videonations can also provide and install the Avocor F series of interactive displays that are built on a Windows 10 platform, which is just like a giant tablet on the wall, delivering instant familiarity for every use. Teams can gain access to everyday applications such as Word, Excel and PowerPoint straight from the display. Nureva Span cloud-based software on Avocor displays creates a rich ideation space which engages and empowers teams through interactive project based business tools. 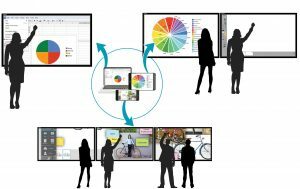 Nureva Span software enables teams to capture their thoughts and ideas, share them on an expansive canvas/wall or Avocor F series displays, and actively collaborate with colleagues discuss concepts, ideas and create real inspirations. Nureva Span brings immersive ‘true’ collaboration into the workplace which enables creativity and critical thinking to reach goals through productive and engaged work. As suppliers and installers, call our experts today to see how the Span software can make a real difference to your creative ideas.